Difficulty level: I'm classifying this trail as a "special moderate". Easy because it's only 5 days long - 3 days uphill followed by 2 days downhill - and because like other “tea house trails”, it has comfortable, almost luxurious places to rest your weary bones every night. But it is difficult too because it has a few patches of starkly steep climbs. One of my favourite memories from the week is Rigveda craning her neck up to see the tea-house I was pointing at, the place where we were going to take our third and last break for the day. She stared at it for five seconds in silence, and then said - "let's not kid ourselves, Manjot, there's no way either of us is going to make it up there" (her exact words were, "dekho Manjot, ye hoga nai hum dono se, main bata rahi hoon". And this was the first day of our trek - things got much, much worse before they got better. 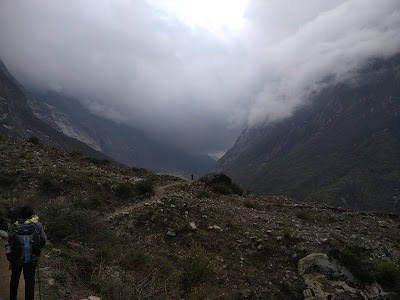 Why Langtang? Now that I am done talking about the painful part of the trek (I make no promises, it may come up again), I can list the joys - breathing the pure mountain air scented with a thousand unknown herbs, walking with your thoughts against a backdrop of birdsong and riversong, having your eyes fill up with more shades of green than you thought were possible, connecting with people and your self in ways that are just not possible in places that are not the Himalayas - we all know these elusive joys which call us to the mountains again and again. We chose the trek also because its duration was perfect. I needed to take only a week's leave and sandwiching it between two weekends covered two travel days and one recovery day. And as many bloggers informed us, traveling through this part of Nepal is an opportunity to contribute to the rebuilding that is still going on after the devastating 2015 earthquake. Planning the trek: Rigs and I planned the trek for 6 months, but that's just us. 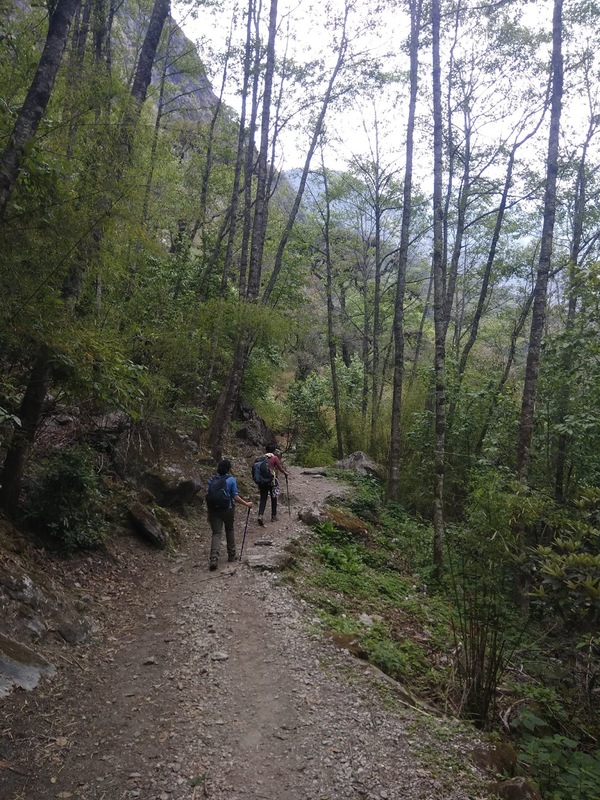 We had a shared folder with packing lists, iterating itineraries, trek company quotes, best dates, debates on whether to do it alone or with guide or with guide and porter both. Contrary to some blogs that we read who strongly urge you to do the trail alone, we recommend taking a guide even if you're a reasonably experienced hiker, and even though the path is fairly well-marked. There are some confusing forks on which you might not get hopelessly lost - all paths eventually get to the main trail (haha this could be a deep insight) - but you might end up spending a lot of time on a longer, less picturesque route that tires you out. A guide will give you an anxiety-free mind space to focus on your self and the beauty around you, educate you about local culture, tell stories and if you're lucky, even become your friend. The actual trek is only 5 days, but our trip was 9 days inclusive of days to travel to and from the trail. Day 0: Arrive in Kathmandu. Friday, 25 May - We stayed at the Oasis hotel, which was nice and comfortable, and located in Thamel, which is downtown Kathmandu, and which is where everything is. Saturday, 26 May - Not the most comfortable road trip, no matter how optimistic I try to be. But the views were lovely. We took the jeep on the way up, bus on the way down (day 7), but neither is for the fainthearted. We stayed at the Noryang guest house, which was lovely. Day 2/Trek day 1: Trek from Syafrubesi to Lama Hotel (2400 m) - about 7 hours of walking. Sunday, 27 May - Breakfast at Noryang was lavish and delicious and we started our trail at 7.30 AM in a fairly lighthearted way, oblivious to the steep horrors awaiting us this day. 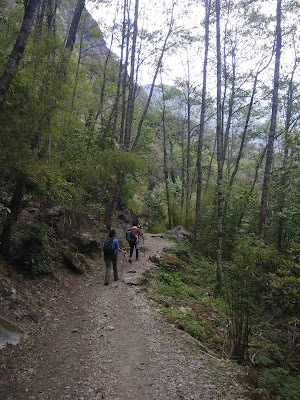 The trail to Lama is a gentle forest walk through marijuana (yes) fields but does have a few extreme slopes. The river was a noisy walking buddy throughout this first day. There are four guest houses on the way that one can stop and rest at. We stopped for lunch at the Bamboo hut tea at the Tom and Jerry guest house. Both were lovely and we took fairly long breaks, which meant that it was nearly 5 PM by the time we arrived at Lama hotel, where - I'm not joking - found solar-powered hot showers. Day 3: Lama hotel to Langtang (3400 m) - about 6 hours of walking. Monday, 28 May - I was woken up by a bird singing and thought, man, how predictable is that? As it happens so often in the mountains, I had a sudden flash of insight. That there are three big reasons why I like hiking through the Himalayas. One, life just becomes so incredibly simple - sadness is a blister on your toe, happiness is the sight of a flat walk after a mad uphill climb. Two, food is a million times more delicious. Literally everything you eat feels like poetry in food. Three, my eyes love the high def views - the stark yellows and reds in the flowers, the stark greens in the trees, the skies so perfectly blue (except when it rains when the skies become an equally perfect, high definition grey). We left Lama hotel soon after 8 AM, walked through villages with pretty names - Riverside, Ghodatabela, Thansyab, Gumba - and arrived at Langtang by 3 PM. Although this is probably the most significant height gain of this trail, it felt gradual and easy, perhaps also because we had toughened up. 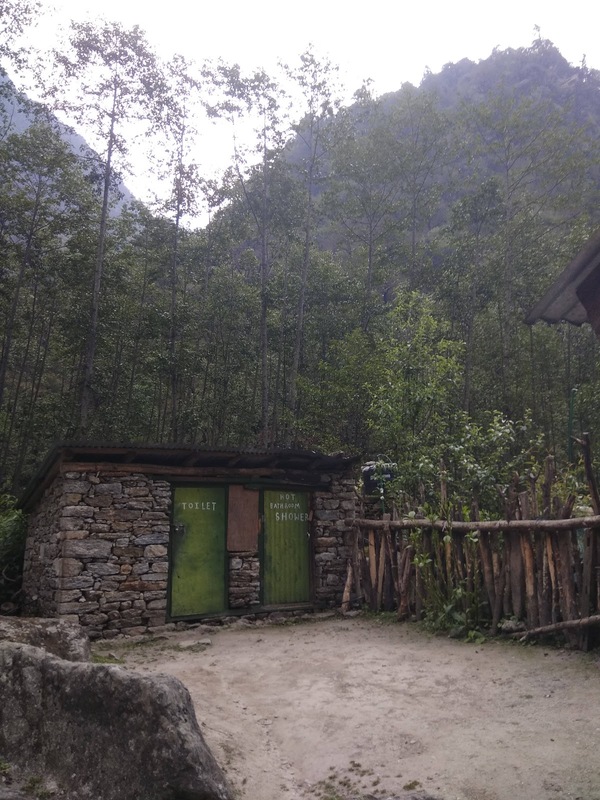 We stayed at the Glacier guest house, run by a lovely man named Tshering Dorje. I strongly recommend the place. 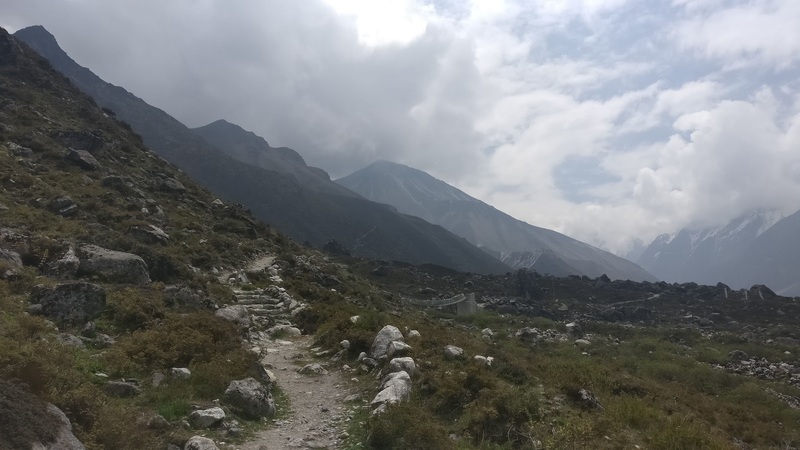 Day 4: Langtang to Kyanjin Gompa (4000 m) - about 4 hours of walking. Tuesday, 29 May - This is perhaps the easiest hike of this trail, with very gentle slopes. You know you're getting close to the tree line - trees start to get fewer and shorter. This is the day we crossed the villages that got the worst of the 2015 earthquake. It was a sobering hour as we walked through the rubble. We arrived at Kyanjin Gompa just before 3 PM. This hamlet has a at least a dozen guest houses and they all look comfortable. We stayed at the Nayakhanga guest house which maybe has the best views in the village. It may or may not be Nayakhanga's fault that I got carried away and wrote a poem here. Wednesday, 30 May - The climb down in this stretch is easier than the climb up, and views are as lovely. It was fun to say hello again to the tea houses we had stopped at two days previously. Thursday, 31 May - Spoke too soon, this downhill walk nearly succeeded in murdering all of my toes. It was such joy to get back to our dear old Syafrubesi, which as it turned out, has a natural hot spring where you can soak your feet and coax them back to life. Friday, 01 June - I spent the seven hours alternating between napping and saying "wow, how pretty is that mountain!" Saturday, 02 June - I have two highlights from this day of recovery at Kathmandu. One, the hotel we chose this time, the Nepal Cottage Resort, felt like absolute luxury with the unlimited hot water and warm beds. It also has a beautiful garden. Two, we watched a fabulous Nepali band perform at the Purple Haze rock bar. I want to come back in live in Thamel for a week sometime, walking and eating and listening to music. In spite of the dust clouds. About that, Kathmandu - what is it with being global #5 in the most polluted cities in the world?! Sunday, 03 June - My journal entry from this morning says: "So when can I go next to the Himalayas?" This winter, four of us - my brother, his wife, Prashanth and I - traveled to Japan for a two-week vacation. This was our second vacation together (the first was Germany in winter 2017). These two folks live in Sydney and naturally want to escape the December weather. And somehow, they've managed to sweet-talk me and Prashanth, both lovers of tropical weather, twice, into these super wintry holidays. We travel well together though - we're all an equal-ish mix of curiosity, laziness and affability. If anyone tells you that a vacation to Japan is going to be unlike anything you’ve done before, believe them. We got back 8 weeks ago and we find ourselves constantly looking for Japanese food and culture in Bombay, like recovering junkies looking for the next fix. Short summary - yes it blew our minds, yes it was cold, no there were no cherry blossoms, yes the highlight of our trip was indeed the food, and yes we're dying to go again. In no particular order, here’s a list of things I loved in each city. 9 hours Shinjuku north: If you’ve never stayed in a capsule hotel before, do yourself a favour and do it soon! Unless you're acutely claustrophobic, the space should not be concern: they’re not like MRI machines, which is how I imagined them – more like 5x the size of an MRI machine. I had three nights of amazing sleep in the capsule. There are a few minor inconveniences – you need to check in and out of your capsule every day, but they give you a roomy locker to keep all your stuff, and there are literally hundreds of coffee shops and restaurants next door. The Onsen at Spa La Qua: We spent two afternoons (4 hours plus) here out of a 5-day trip. Need I say more? Harajuku street: Very interesting neighborhood to walk around in – fantastic coffee, dozens of local designers to look at or buy from, stores with beautiful snacks and desserts, cafes where you can spend time with hedgehogs, cats or owls. We rolled our eyes at the weirdness of it all, then caved in an spent a lovely 30 minutes with some very sleepy hedgehogs. The famous Shibuya crossing is closeby, as is the Meiji shrine. Meiji Shrine: High on all tourist lists, and with good reason. Bar crawl with Alejandro (this is an airbnb experience) who took us on a very memorable walk around the izakayas on harmonica street. Stationery stores: The city is a heaven for stationery lovers. We went to so many but Inkstand by Kakimori is perhaps my favourite. I've come back a person who now writes with fountain pens. Top three food recommendations for Tokyo: Ramen at Zundo-ya in Shinjuku, Katsu curry at any of the CoCo Ichibanyas and burgers at Blacows. Arriving in Kyoto after spending a few days in Tokyo feels like stepping back in time. It’s quieter, slower and has unbelievably picturesque streets that you can walk around in for hours, even in winter. I can understand how popular it is for cherry blossom enthusiasts – every street corner looks instagrammable. We stayed in Kyoto Inn Gion and I strongly recommend both the hotel and the neighborhood. If I live in this city for 10 years, I will not get tired of walking around. I recommend walking in the many interesting neighborhoods –Shirakawa, Pontocho, Nishiki market, Shijo dori – over multiple days, at different times of the day, because they look lovely in so many ways, especially the Shirakawa street. Shijo dori street has multiple dessert stores which have some truly exciting mochi-type sweet snacks which I recommend trying. We also participated in a tea ceremony which I enjoyed a lot. Another highlight of Kyoto was the music performance we watched at the Kyoto Muse. This city is famous for the breathtakingly beautiful shrines in the middle of massive gardens. The most popular ones are Fushimi Inari - made famous for the gazillion pictures of orange pillars on Instagram and Arashiyama - the one with the massive green bamboo trees, you’ve seen the pictures, you know what I’m talking about. We went to Fushimi Inari and I have to be honest, I did not enjoy it. The crowd was too overwhelming. But when we walked across the street from our hotel to the Yasaka shrine, which is not on any top 10 list, we experienced such perfect beauty and the silence that I will remember for a long time. Top three food recommendations for Kyoto: Katsu curry at Kara-Kusa curry, Omurice at Fu-ka Ginkakuji, and Okominyaki absolutely anywhere. Onsen at Spa world – yes, onsen again. Onsens are definitely among my top 3 Japanese experiences. Physician, mountaineer, skydiver, public health professional. Committed to eradicating TB in my lifetime.